The Court Jester known as "Knight Christoph"
Hans Wertinger was a German painter active in the first third of the 16th century. His work evolved from an early phase, characterised by a use of late Gothic elements, to a mature style in which the influence of Dürer, Altdorfer and the Danube School is evident. This latter influence is manifested in the increasing emphasis on landscape in Wertinger’s paintings and in this respect he became a reference point for other artists from the area. The present canvas is one of the first examples of a German, full-length portrait. The sitter is depicted in profile with the body slightly turned, posing against a low wall that separates the foreground space from the landscape. Elegantly dressed, this court jester places his weight on one leg, firmly grasping his sword and clenching his other fist. The date of the painting is known from a 17th-century inscription on the reverse in which the sitter is also named as “The Knight Christoph”, court jester to the Prince-Bishop of Freising, Count Palatine of the Rhine and Duke of Bavaria. It is thought that the portrait may have been in the ducal collection. Hans Wertinger, an artist whose early activity remains largely unknown, may have trained in an Augsburg workshop or in Munich. The first available information on the artist dates from 1491 when he was made a citizen of Landshut. Between 1497 and 1499 he received various commissions from the Prince-Bishop of Freising for designs for stained glass in the city’s cathedral, while his first documented work, a panel with the life of Saint Sigismund, dates from 1498.Wertinger also received commissions from the Elector Frederick III of Saxony. He was a versatile artist who worked not only in mural and easel painting but also in miniature and illustration, producing designs for prints. 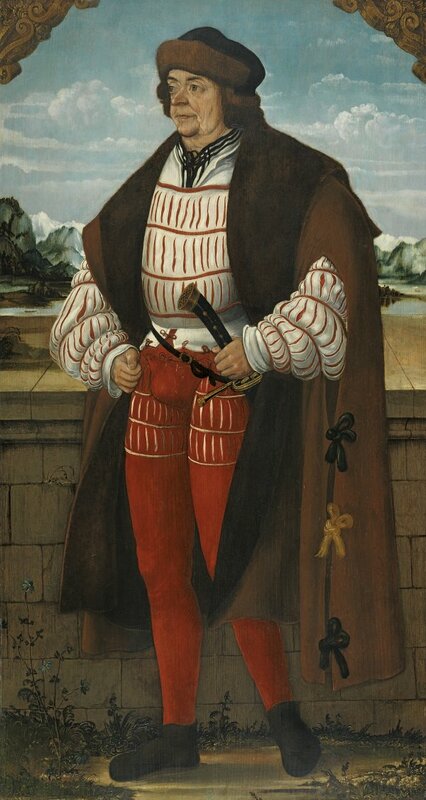 In Landshut, Wertinger enjoyed the protection of Duke Louis X of Bavaria-Landshut and was named court painter to the Duke in 1518, the period when he was most active as a portraitist. The identity of the present sitter and the date of the painting are known from a 17th-century inscription on the reverse of the panel which refers to the sitter’s name and identity: “Knight Christoph”, court jester to the Prince-Bishop of Freising, Count Palatine of the Rhine and Duke of Bavaria. The inscription may have been copied from one on the original frame (now lost) or have been at the lower edge of the painting, as suggested by Feuchtmayr, an idea not shared by Lübbeke. The panel is very probably the one that appears as number 3301 in an inventory of 1598 compiled by J. B. Fickler, in which it is recorded alongside other portraits of buffoons from the ducal collection. Knowing the sitter’s identity enables us to understand the type of presentation that Wertinger used as well as the sitter’s pose. It should be mentioned that this is one of the first full-length portraits of this type known in German art. The buffoon poses outdoors in front of a low wall that divides the pictorial space with a landscape in the distant background. Knight Christoph is shown in more than semi-profile, looking to the left and wearing elegant clothes although there is a sense of disjunction between his strong, robust body and his aged face. Resting his weight firmly on one of his legs with the other in a relaxed position, Knight Christoph grasps the handle of his sword while his other fist is clenched, creating a similarity of gestures between the two hands. The upper corners of the canvas have discreet decorative elements that visually lead the eye into the composition, a device often found in Wertinger’s early works in which he included festoons, garlands, vine tendrils and decorative frames. “Knight Christoph” was in the ducal collection in Munich and in the collection of Leonie Freiin von Boyneburgh in Wielfingerode. It entered the Thyssen-Bornemisza collection in 1934 from the Berlin art market.